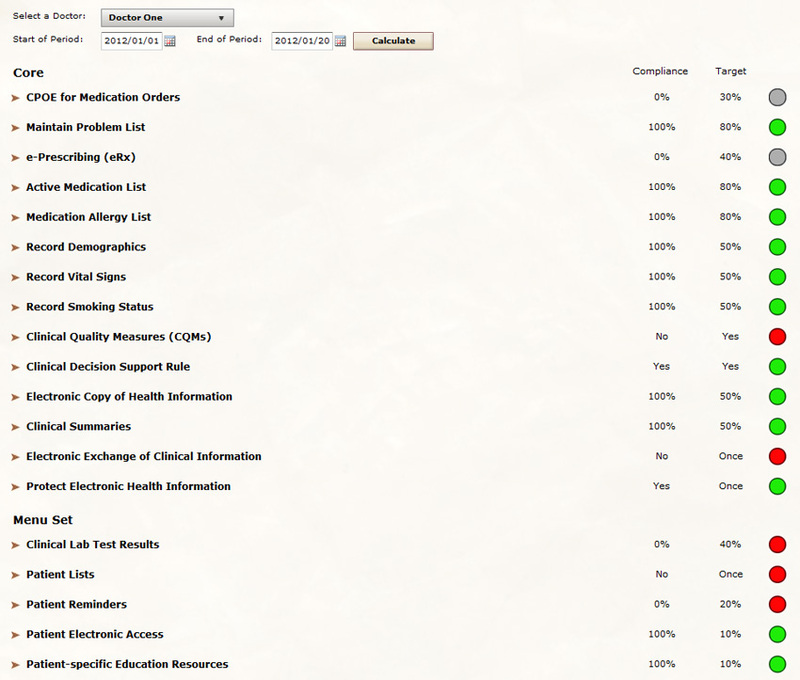 The Meaningful Use Report allows you to view your compliance with the various Core and Menu Set objectives. Clicking on the arrow to the right of each measure will reveal more information about the measure. BackChart® COS Help: A short description of what to do in BackChart® COS to meet the objective. The Numerator and Denominator are also listed in the expanded details. These numbers provide a count for each measure, are what determines the percentage, and are what is reported to Medicare. 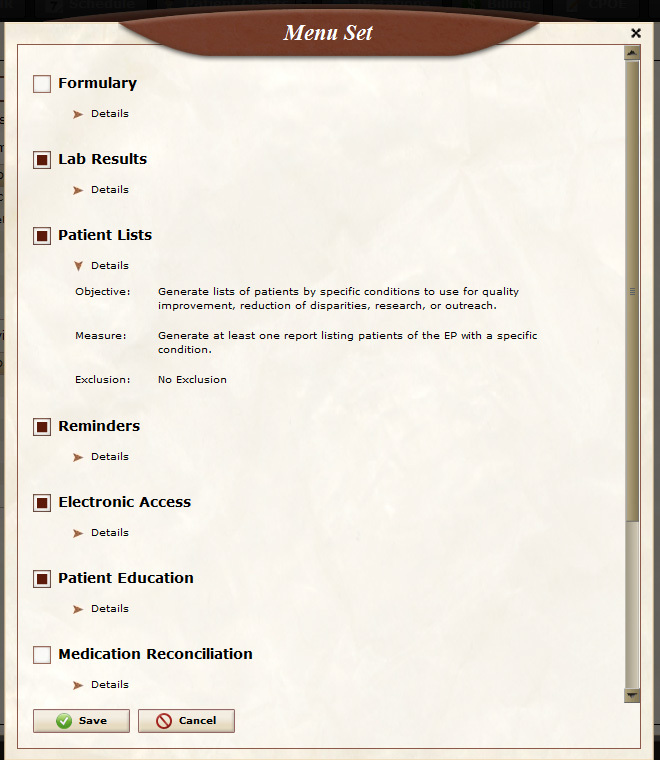 Lastly, there is a button labeled “Patient List”. Clicking on it will bring up a list of all the patients who are not included in the Numerator but are included in the Denominator. This makes it really simple to improve your performance in case you miss a Meaningful Use item with a patient. 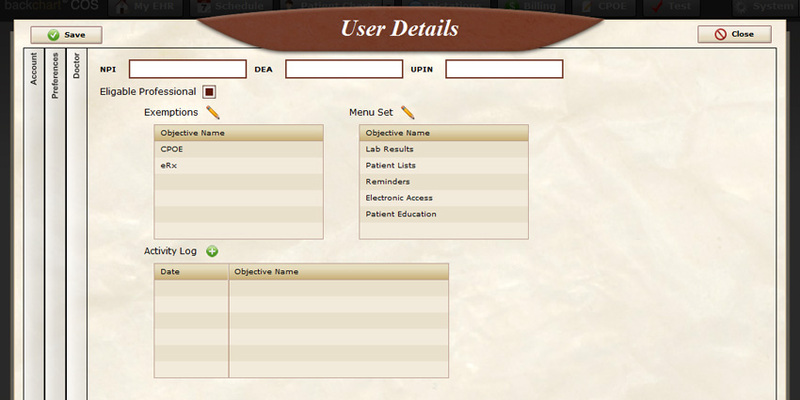 Every item in the Patient List when clicked on, will open that patient’s chart. At this point any errors can be fixed. The list will stay open, allowing you to click through the list and fix all missing items. Objective: Implement drug formulary checks. Measure: The EP has enabled this functionality and has access to at least one internal or external formulary for the entire EHR reporting period. Exclusion:Any EP who writes fewer than 100 prescriptions during the EHR reporting period. 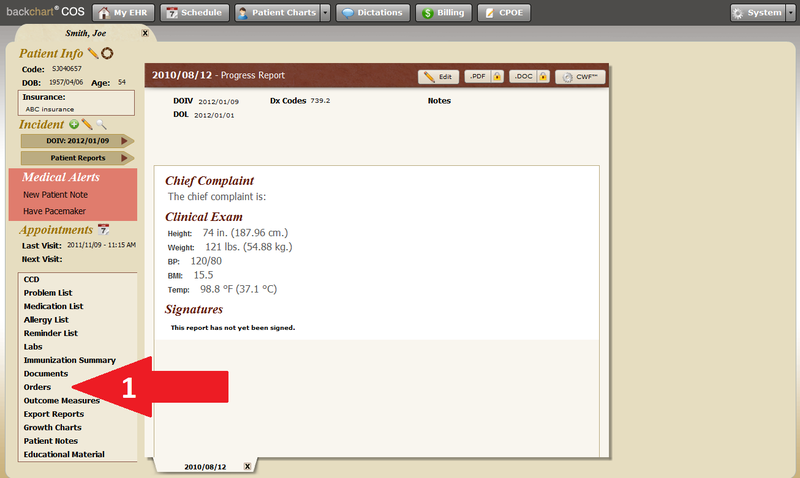 Objective: Incorporate clinical lab test results into EHR as structured data. are incorporated in certified EHR technology as structured data. numeric format during the EHR reporting period. 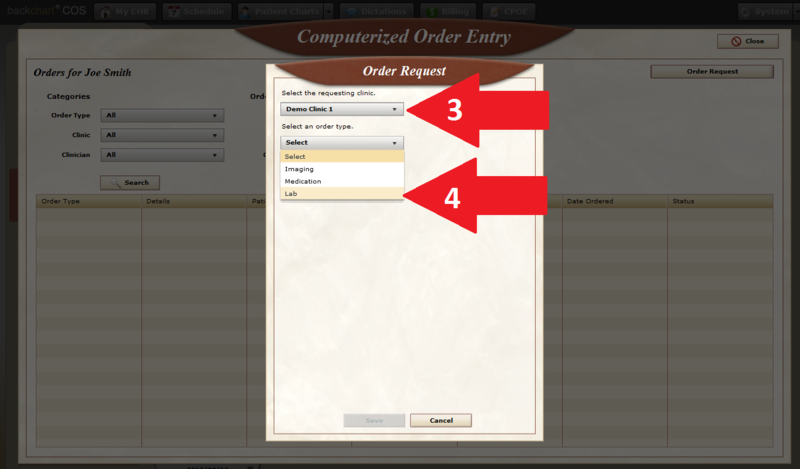 1 – While on the patient’s chart, select the link that says ‘Orders.’ 2 – After you enter into the next screen, select ‘Order Request’ on the top right. 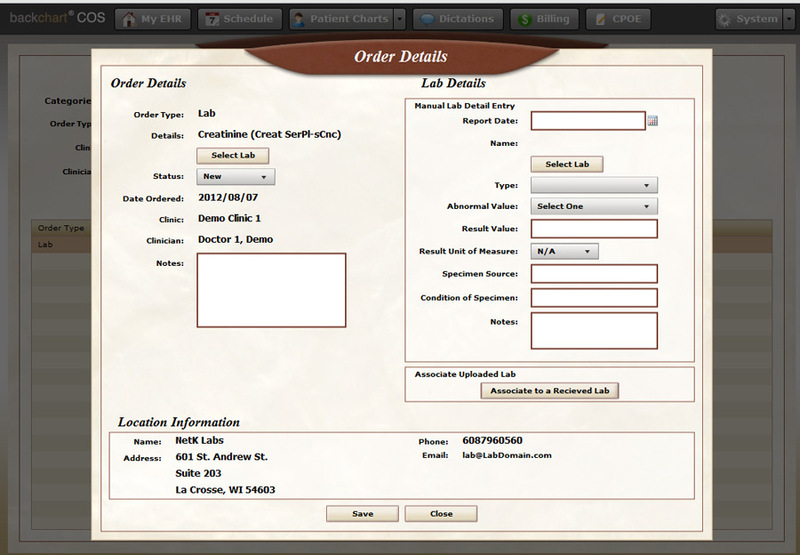 3 – Select the correct ‘requesting clinic’ ordering the lab. 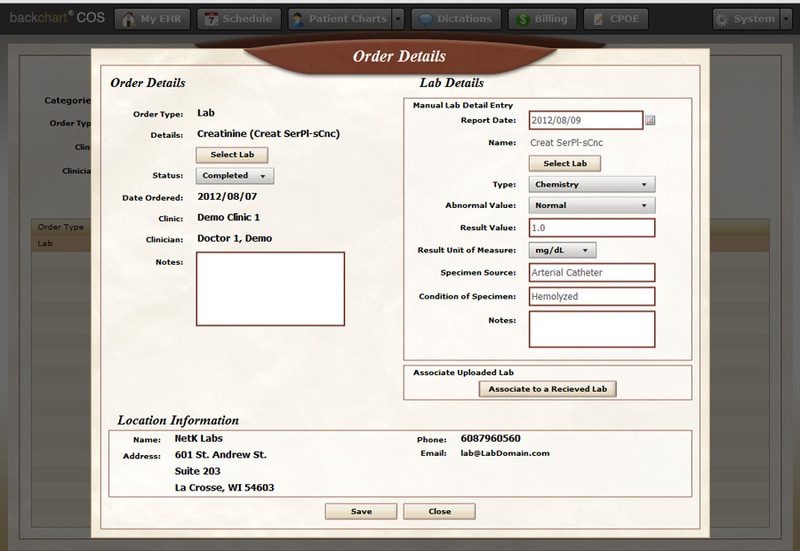 4 – Select ‘Lab’ under the order type. 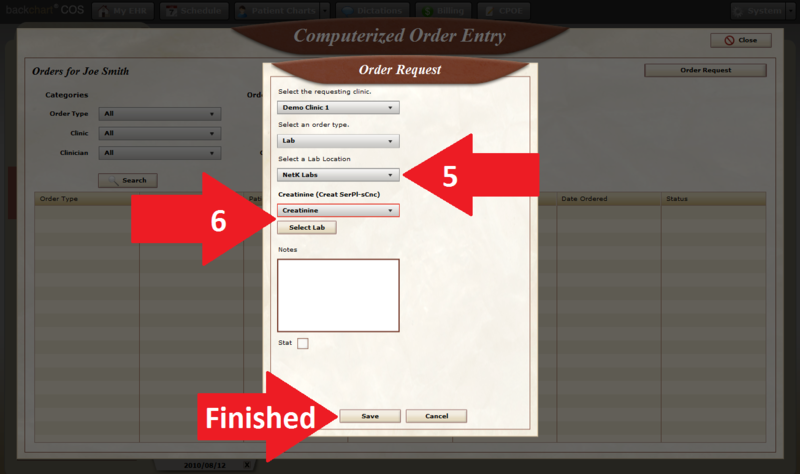 5 – Select the ‘Lab Location’ you are placing the order from. 6 – Select the Lab and include any notes about the lab. 7 – Select ‘Save’ and you are finished. When you get the results back from the lab, you can complete the order by attaching the results to it. 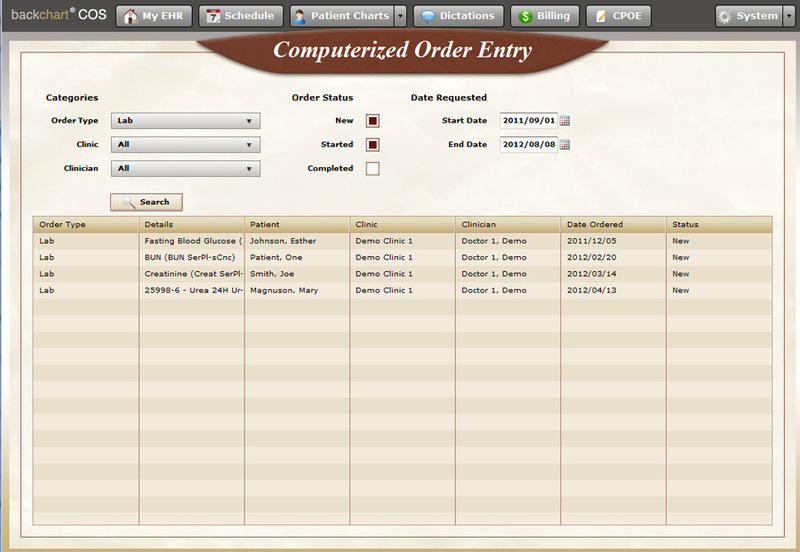 2 – Click on the order to bring up its details window. 3 – Enter the results from the Lab on the right side under Lab Details. 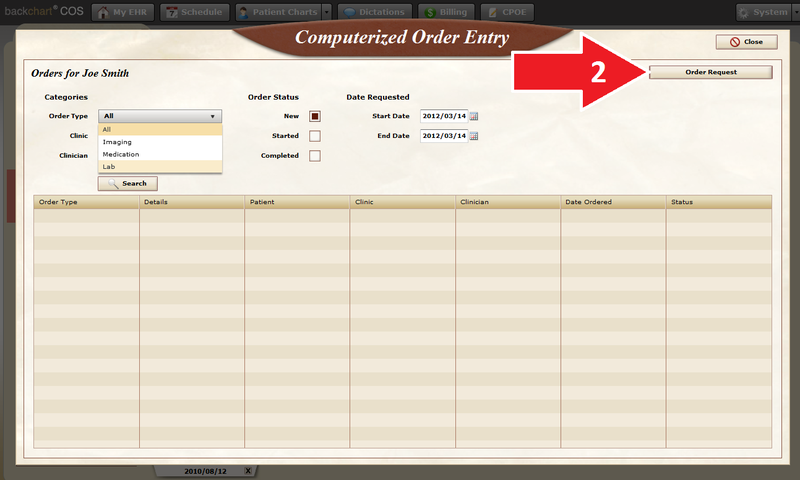 You can also mark the order as complete by changing the status drop down under Order Details. NOTE 2: BackChart will not order the Labs for you. BackChart only makes a record that you have ordered labs. information systems and actual submission according to applicable law and practice. 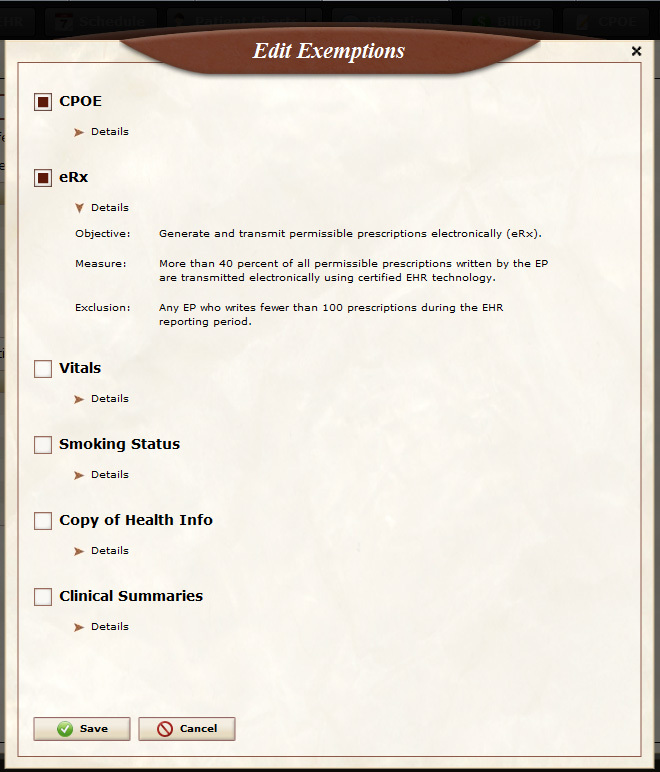 Measure: Performed at least one test of certified EHR technology’s capacity to submit electronic data to immunization registries and follow up submission if the test is successful (unless none of the immunization registries to which the EP submits such information has the capacity to receive the information electronically). Exclusion: An EP who administers no immunizations during the EHR reporting period or where no immunization registry has the capacity to receive the information electronically. Objective: Capability to submit electronic syndromic surveillance data to public health agencies and actual submission according to applicable law and practice. health agency that has the capacity to receive the information electronically. If you are performing setup for yourself, use My Account. 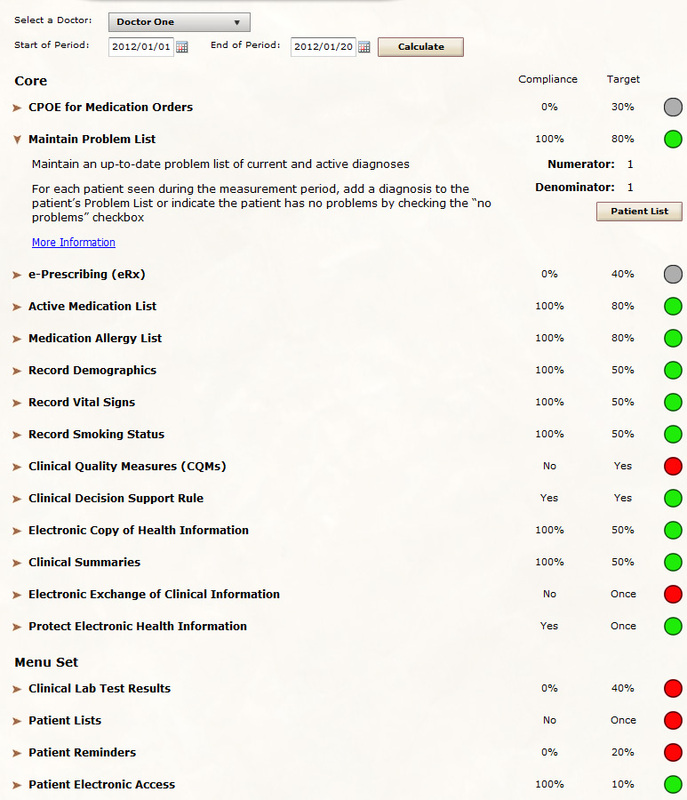 The Meaningful Use dashboard widget is available to those users who are set up as doctors. When you first login, you may see the Meaningful Use widget on the dashboard which will be empty or you may not see it at all. There is some setup that needs to be performed before it will be visible or display your Meaningful Use statistics. 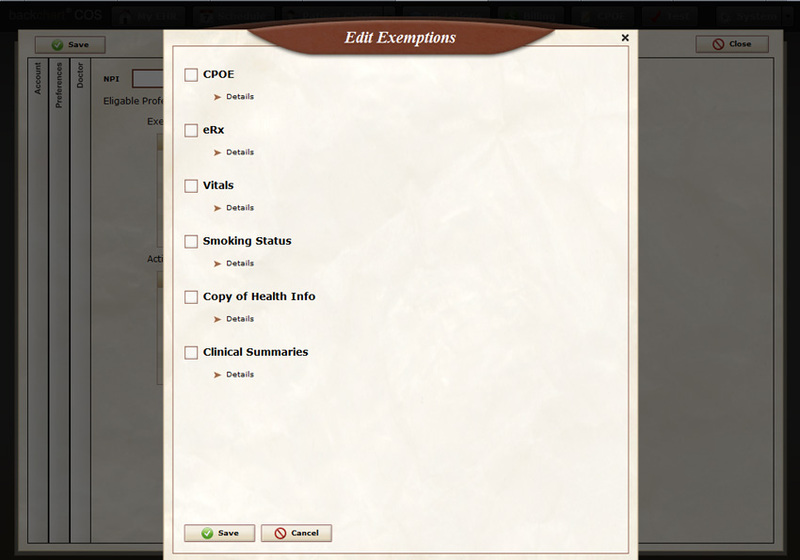 With the EP check box checked, the Meaningful Use setting will appear. The first area is the Exemptions. This allows you to tell the system which Meaningful Use items you are exempt from. Click on the pencil icon to bring up the Edit Exemptions window. You can click on the arrow to the left of Details to see the measure information. Check the boxes next to any measure(s) you are excluded from. After clicking save, the exemptions you selected will be displayed in the list. You can always make changes to these by clicking the pencil icon. The next area is the Menu Set. This allows you to tell the system which Menu Set items you are going to report on. Click on the pencil icon to bring up the Menu Set window. Medicare would like you to pick 5 items out of this list of 10 (our recommendations). You can click on the arrow to the left of Details to see the measure information. Check the boxes next to the items that you would like to demonstrate compliance with. Click save to save your choices. 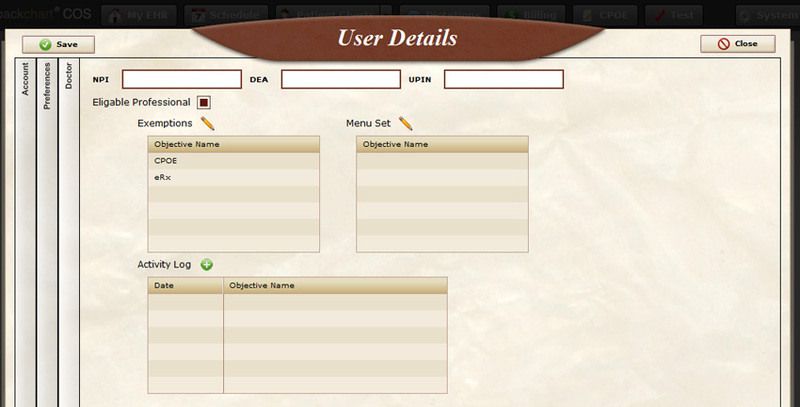 You will see your Menu Set selections appear in the list. The final area is the Activity Log. This area will allow you to document the one time occurrence measures. For example, Core item 15: Protect Electronic Health Information, requires you to perform a security audit during the reporting period. You can record that you have completed a Security Audit here. 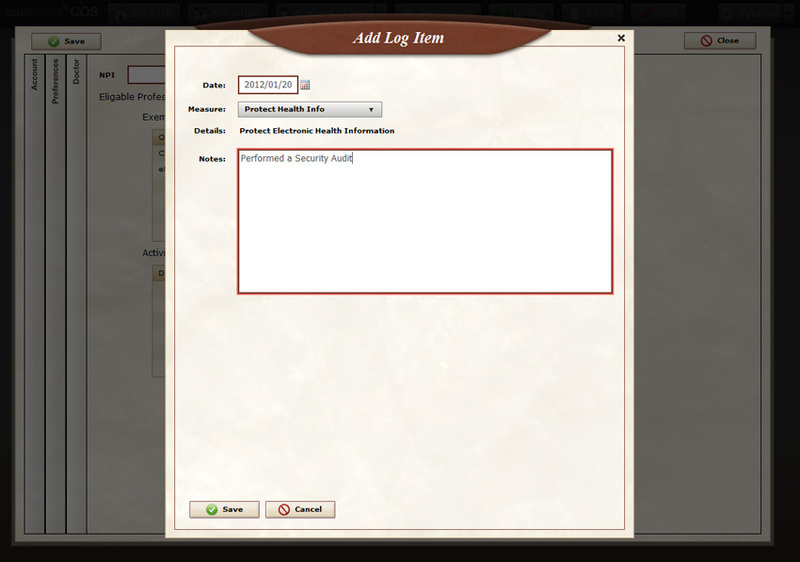 Note: You may not have any items to log at this time. Come back to document items when you complete them. 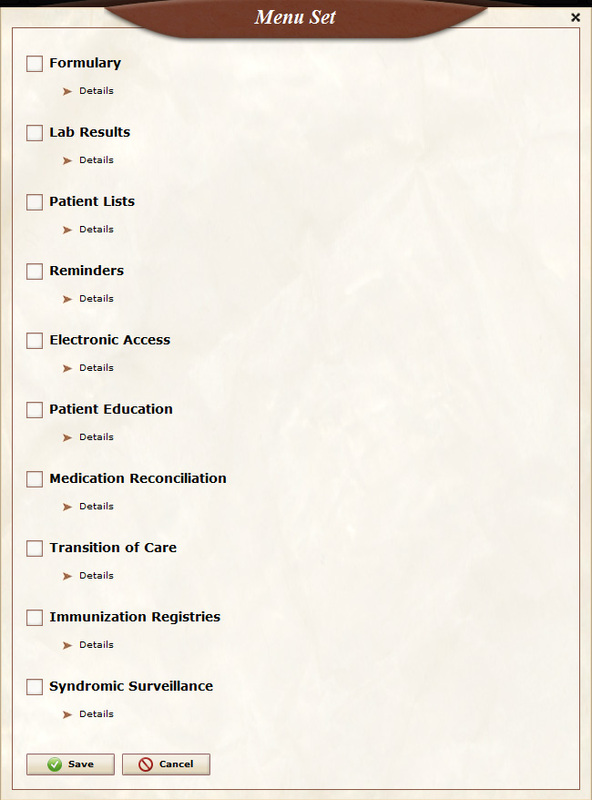 At this point, you can click save and return to your dashboard (My EHR). Select the start date that you would like to begin tracking from* and click refresh. You will see a graphical representation of your Meaningful Use statistics. Green shading indicates that you are in compliance with that measure, yellow shading indicates that you are slightly in compliance with that measure, grey shading indicates that you have set an exclusion for that measure, and red shading indicates that you are out of compliance with that measure. Hovering over each section will display: The measure name, your statistics, and what it takes to be in compliance with that measure. *If you are past your first year of Meaningful Use, this will be Jan 1. Objective: Generate lists of patients by specific conditions to use for quality improvement, reduction of disparities, research, or outreach. 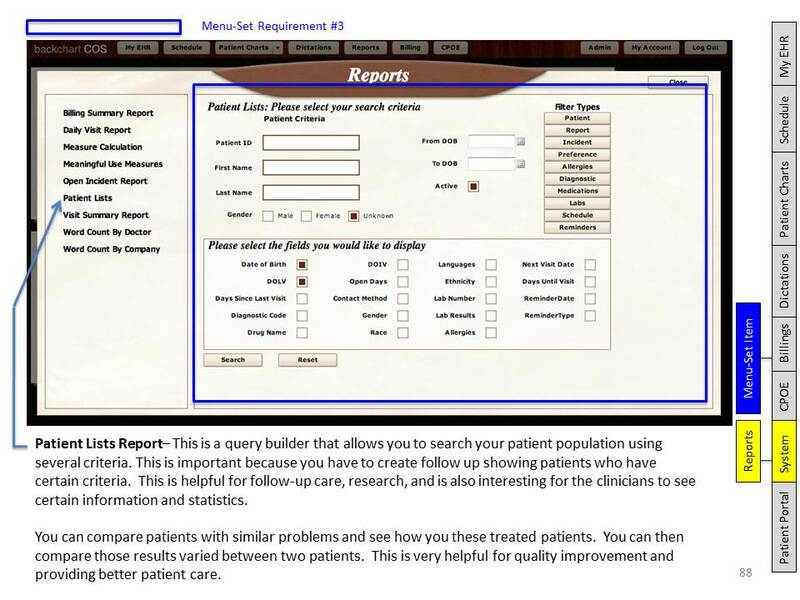 Measure: Generate at lease one report listing patients of the EP with a specific condition. 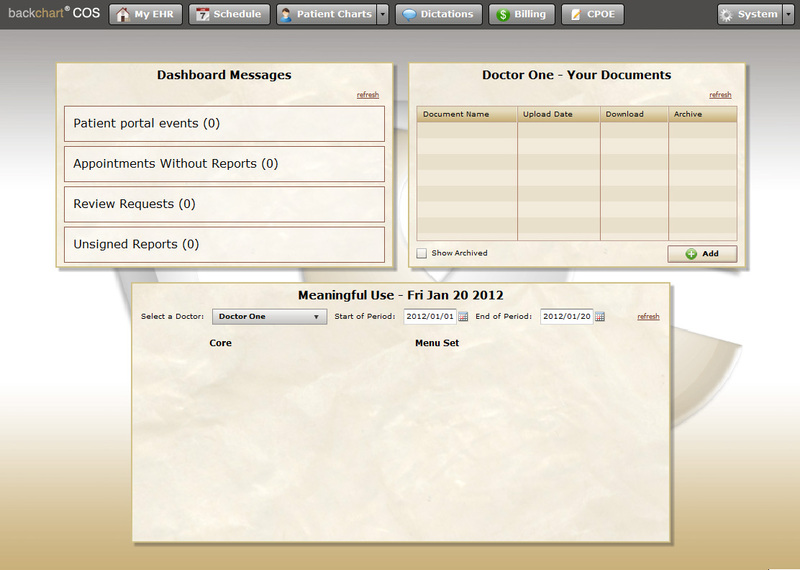 Objective: Send reminders to patients per patient preference for preventive/follow-up care. Measure: More than 20 percent of all patients 65 years or older or 5 years old or younger were sent an appropriate reminder during the EHR reporting period. Exclusion: An EP who has no patients 65 years old or older or 5 years old or younger with records maintained using certified EHR technology. for each transition of care or referral. Exclusion: An EP who neither transfers a patient to another setting nor refers a patient to another provider during the EHR reporting period. believes an encounter is relevant should perform medication reconciliation.